Last week I had a bird identification question. 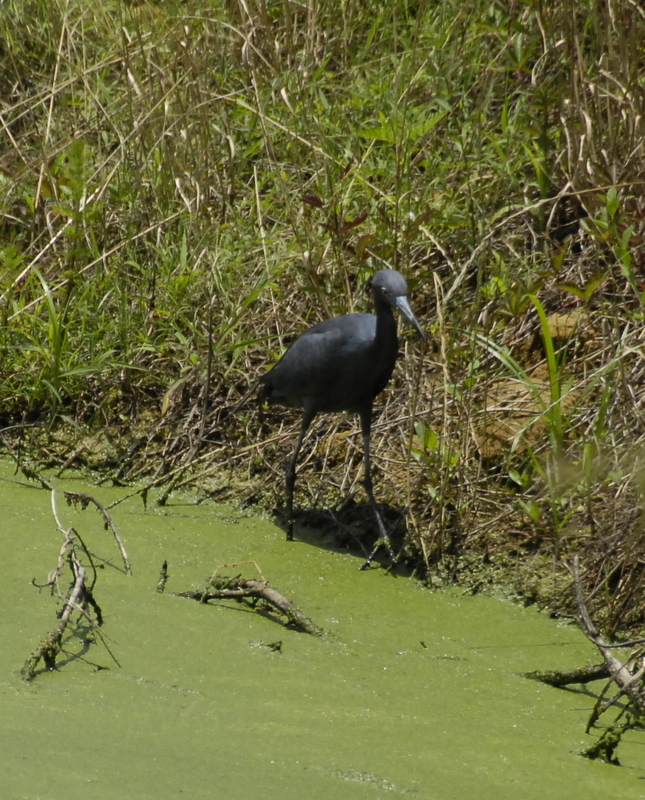 It was a Little Blue Heron. It stands 24 inches tall and is fairly common. It feeds by wading slowly and getting small fish. Its young is white colored. The bill is pale blue with a darker tip. 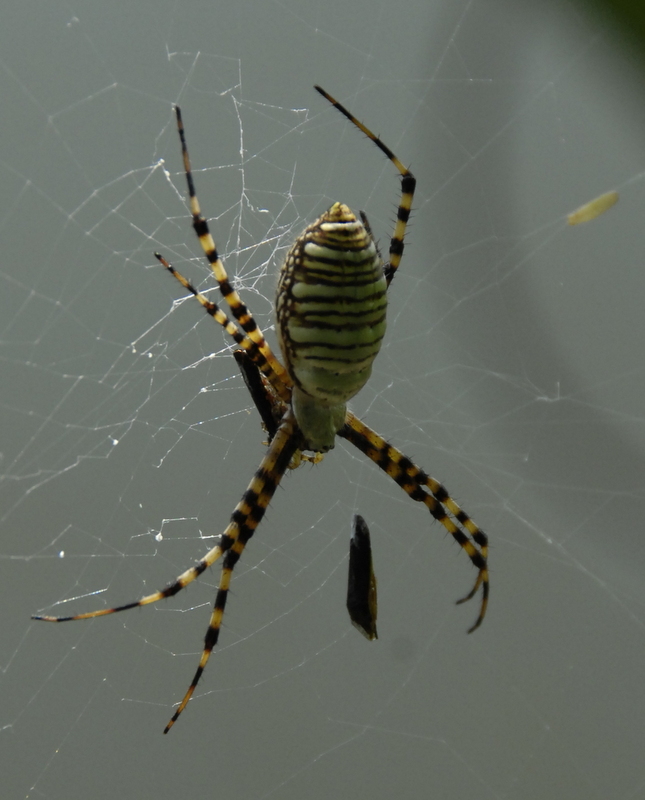 This week I saw this large spider in a corn field with it’s web between 2 stalks of corn. It already had one insect beside it and I hope it will provide us with some biological control of the stinkbugs out there. What spider is this? 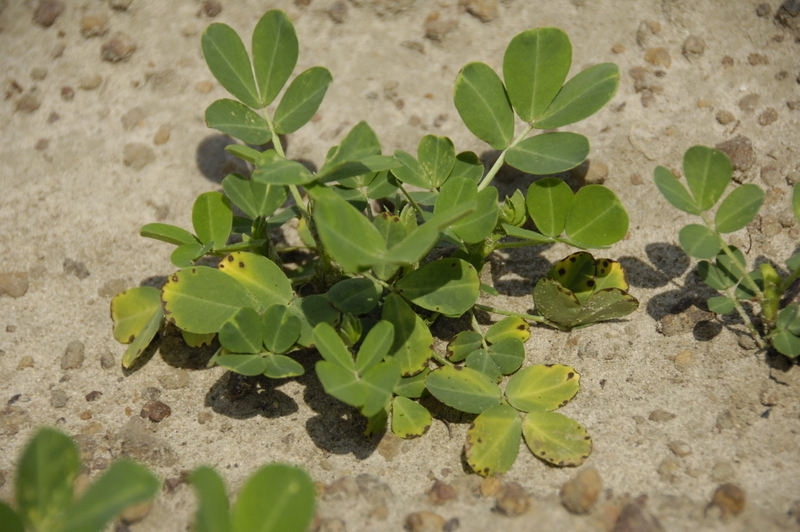 Peanut burn is common on older peanut leaves due to the in furrow insecticide, usually phorate aka thimet, that is moving through the plant. After a rain or irrigation the chemical moves into the plant and in doing its job to control thrips it causes some burn to the plant and can even cause some leaf drop. The burn is usually on the leaf edges and can be confused with leafspot. It will grow out of this injury soon. 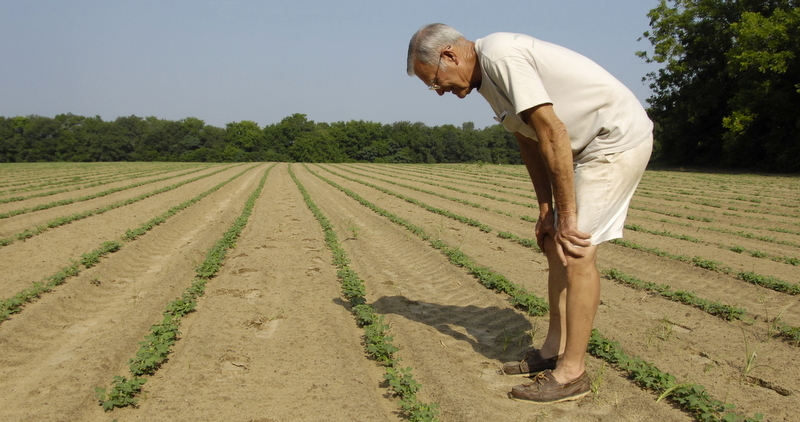 In the botton photo, Philmore Higginbotham is in his peanut field checking for thrips injury earlier this week. He was in good shape as his in furrow insecticide was working well. Thrips need to feed on the plant to ingest the chemical to control them so even with good control you will still see a little feeding damage. Also, down there near Desser they have received pretty good rains recently. Here’s a great plant disease update from Dr. Bob Kemerait, UGA Plant Pathology. This Memorial Day Week is an EXCELLENT time to both assess disease management strategies in your row crops and to assess the risk for the diseases themselves. The importance of this week is based on two critically important factors- crop development and the passage of Tropical Storm Beryl. Even those growers who did not receive a drop of rain from Beryl should still consider disease management now- if for no other reason than winds from the storm may have moved fungal spores over long distances and dropped them literally in their laps. Whether you have corn, cotton, peanuts, or soybeans in the field now and received some rainfall and cloudy conditions from Beryl, then the risk of fungal diseases in your field increases. One factor is that the rain and subsequent cloudy weather, coupled with high humidity, have created near-perfect conditions for the formation of spores on existing spots and lesions. Also, raindrops hitting last year’s crop debris could also send spores to infect lower leaves of the crop. A second factor is, obviously, that the spores that detach from the spots and lesions and land on other leaves also have near-perfect conditions for infection to occur. Extended periods of leaf wetness significantly increase the chance that a spore that lands on a leaf (or other suitable tissue) will infect. A third factor has been the wind. On the level of a field, the mechanical action of leaves brushing up against one another coupled with the mechanical dispersal of rain drops hitting the leaves will send spores from one leaf to another and perhaps beyond. Even if you didn’t receive a single drop of rain from Beryl (wow….) your crop is still at risk from long spread dispersal of spores like southern corn rust and Asian soybean rust. For example, rust spores could be carried in upper air currents from Florida and deposited on the crop; cloudy weather reduces UV radiation and further increases the potential of the spores to survive over long distances. Bottom line: I believe that it is very likely that many fungal infections developed in our crop over the past 48 hours; a week from now we may very well begin to find outbreaks of diseases that would have been much delayed had Beryl not blown our way. Peanut- If your crop has not reached 28 days after planting, I would not be too worried about leaf spot diseases, unless you are planting peanuts behind peanuts. A short peanut rotation will increase the risk for early outbreaks of all diseases. White mold? Yes- that could be a problem early this year. Warm temperatures early in the season coupled by an extended period of moisture could further ignite a white mold epidemic. Bottom line for peanuts? I probably would not change much in an already sound peanut fungicide program, other than to perhaps initiate the program a bit earlier. And where leaf spot disease is already in a field, consider use of a fungicide with curative activity (Headline, Tilt/Bravo, Stratego, etc.) over a pure protectant like chlorothalonil alone. Last couple of notes on peanut: A) so far, tomato spotted wilt has not seemed to be a bad as I thought it might be- growers are doing an EXCELLENT management job! B) Cooler, wetter weather will certainly help to reduce the threat of Aspergillus crown rot on young seedlings. 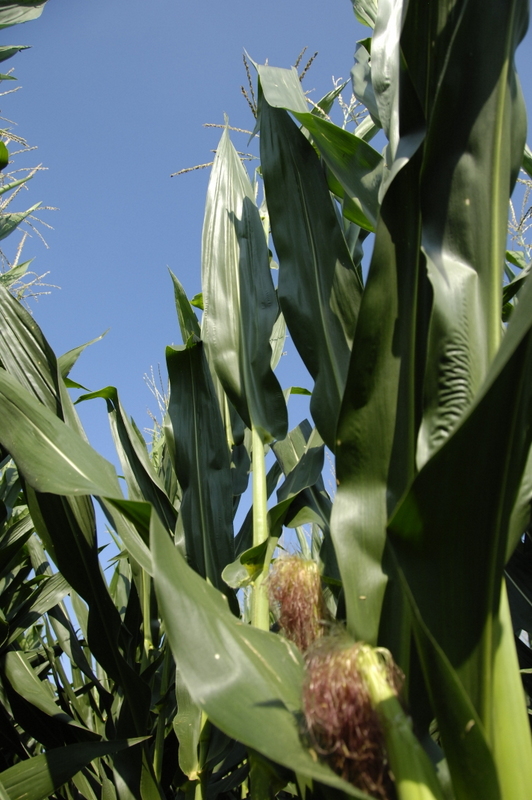 Corn- Much of the commercial corn crop has reached tasseling or will do so quickly. I believe that “tasseling” is an important growth stage where growers need to consider the need for a fungicide; tasseling is NOT the time for an “automatic” application for each and every grower! For example, I believe that some small amount of northern corn leaf blight can be found in the majority of fields in the state but this alone does not necessitate a fungicide application. 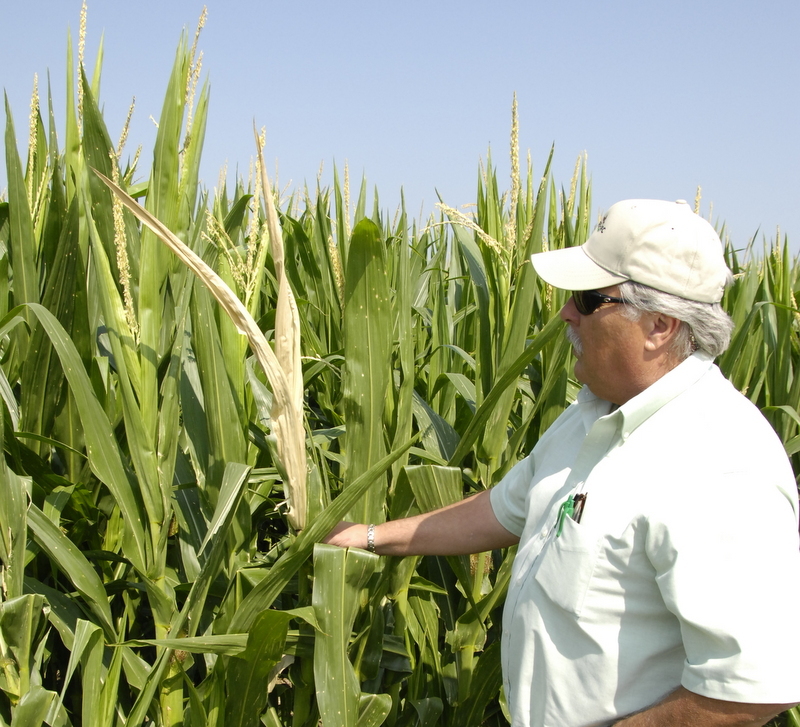 Short corn rotations, a more susceptible hybrid, and wet, windy weather will increase risk to the disease and the grower should be prepared to make an important decision. It has been my experience that unless a hybrid is especially susceptible to NCLB, this disease does not “explode” in a field like rust does. Still, after a passing storm and extended leaf wetness periods, the disease could develop quickly in fields at risk. In such cases, TIMELY applications of a fungicide with curative activity (triazole fungicides) will be more beneficial than a protectant fungicide alone. Benefits of a triazole/strobilurin mix? Extended protective window and curative activity. Bottom line: with Beryl, conditions for diseases in corn are enhanced in south-central and southeastern Georgia. This simply further increases risk; an increase that growers should consider in their decision to spray (or not). If a grower has sprayed a fungicide and is considering an additional spray, he or she should assess the level of disease in the field prior to the storm and the time since the last application. FINALLY- With the passing of Beryl, we will continue to closely monitor the potential for introduction of southern rust with the winds. Cotton- Where rainfall was abundant (it wasn’t in Tifton) growers could see some temporary increase in seedling disease. Also, the same wet weather could produce outbreaks of Ascochyta “wet weather” blight which also should be of only temporary importance. I am most curious about the impact of the weather on Corynespora/target spot. In fields where the disease has occurred in the recent past, the falling rain could splash the fungal spores from the soil to the leaves of even young plants. Will this happen in 2012? I don’t know but I strongly advise growers who find spots on their cotton at any growth stage approaching first square (and beyond) to have it diagnosed quickly. As always- the best way to manage a disease like Corynespora/target spot is to protect the crop early before it becomes established. Soybeans- Asian soybean rust is known to be active on kudzu just across the Georgia-Florida line in Leon and Gadsden Counties. It has not yet been found in Georgia; however I expect it will be sooner rather than later. Once the disease is found, soybean producers in surrounding areas should protect their crop by the late bloom stage. As in southern corn rust, UGA Cooperative Extension is monitoring the introduction and spread of soybean rust closely and results can be found at www.sbrusa.net. Lots of Corn Scald is showing up this week. Mike Johnson of Agri AFC here is looking at some scald at the edge of the field. It’s often seen at field edges. 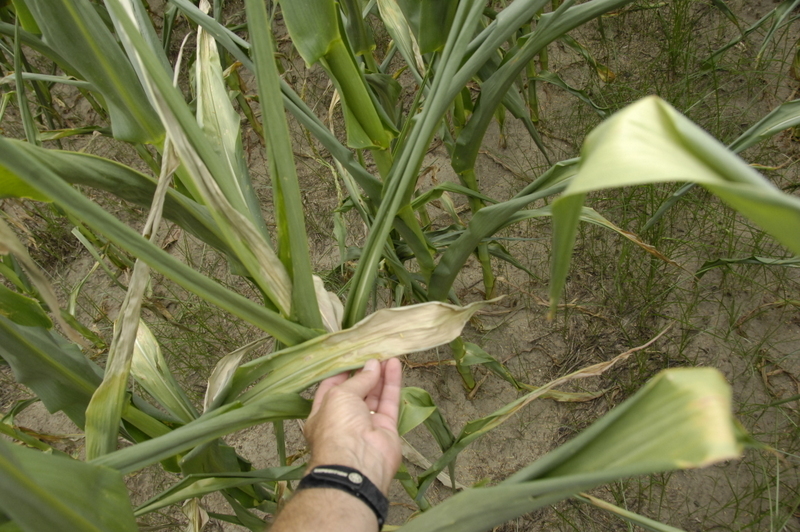 This is where corn is stressed and where heat and wind and dry conditions can affect it worse. Often the irrigation end gun just barely wets some of these areas. I think under very hot conditions the little bit of water some end guns put out cause it to be worse, almost like a magnification of the sun. Definitely the water on the overheated, stressed leaf is a problem. I took off for Memorial Day but the stink bugs decided to really go to work early this week. Yesterday a lot of stink bugs were found in many fields. Most of what I saw were brown stink bugs but other types were present as well. 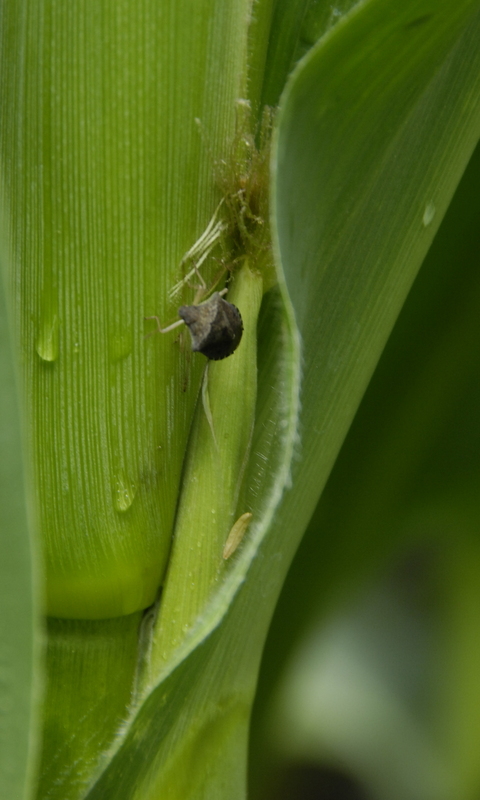 See the stink bug here near the young ear that is very susceptible to damage at this point. 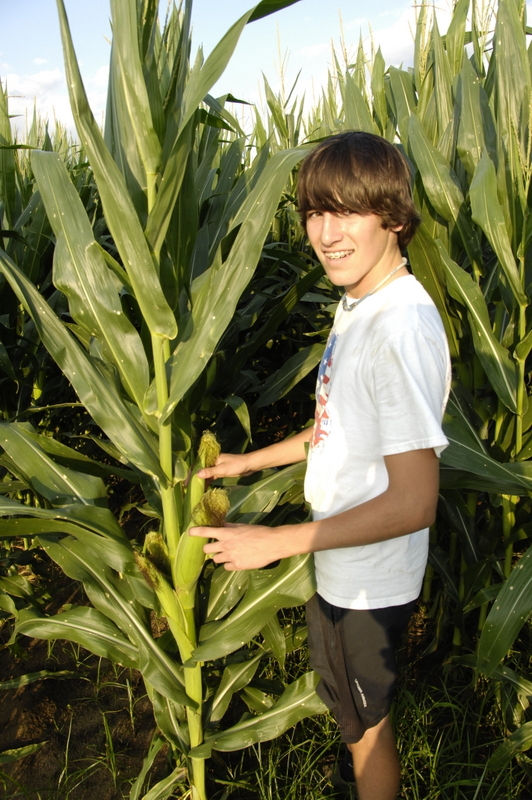 Further down you can see Payson Trawick checking out some of their corn. He’s helping his father and grandfather with their corn fields. Wheat harvest is finishing up on most farms. 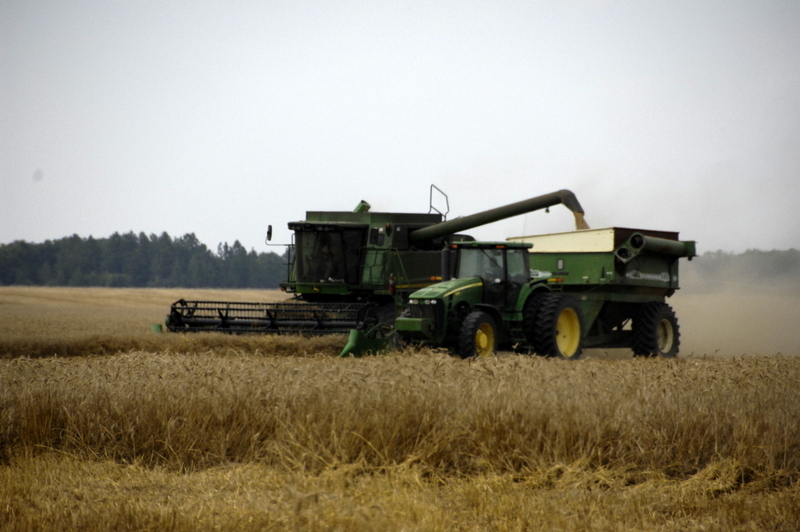 Here’s some wheat being combined on North American Farms near the Donalsonville Airport. Yields have been pretty good but Test weights have been variable. Dr Dewey Lee, UGA Scientist has a good discussion concerning this on his blog at this link http://georgiagraincrops.com/disease/wheat-yield-and-test-weights-vary-in-2012 Some causes he points out are: Rain wetting mature grain before we could get it out, vernalization (getting enough cold), stress during grain fill, disease presure, and winter temperatures. Some folks are through planting cotton and many are almost done. 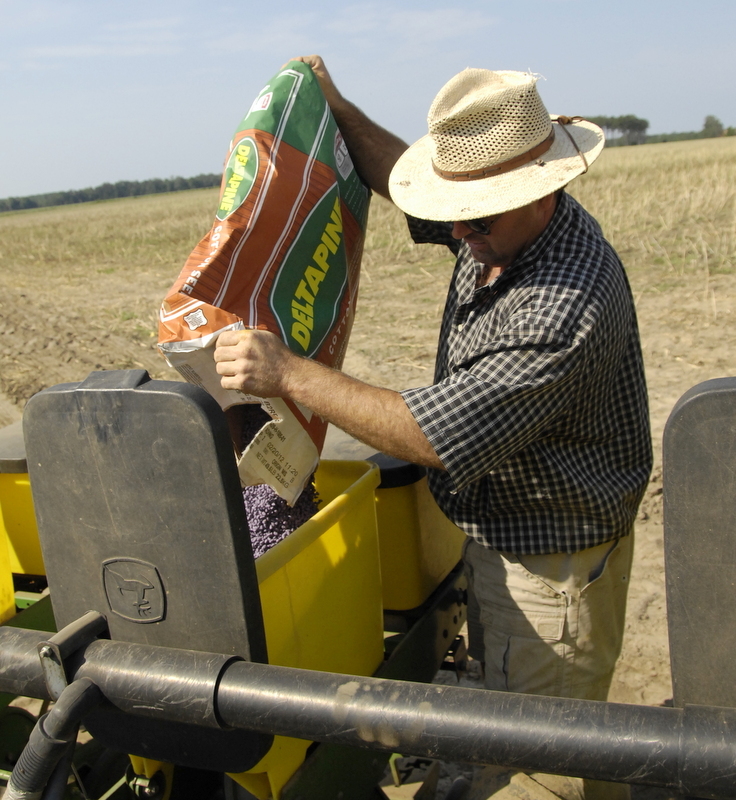 Stephen Houston Jr is here planting some cotton after wheat and canola has been harvested. Stands of cotton look good mostly with a few problems around. Some replanting going on as usual but it’s a much better situation than last year. Thrips have been bad and here’s some information concerning thrips and emerging cotton from the 2012 UGA Cotton Production Guide. immediately, being careful not to completely uproot more than 20 to 25 percent of the seedlings. rapidly at soil strengths above 10 psi when cotton is planted deeper than 1 inch. Thrips are consistent and predictable pests of seedling cotton that infest cotton at emergence. maturity, reduced yield potential, and in severe cases reduced stands. is used, multiple well timed foliar applications will be needed. no green vegetation should be present at planting). seedling growth due to cool temperatures or other plant stresses. • A rapidly growing seedling can better tolerate thrips feeding. Corn is really progressing and looking very good. It’s silking and silks are drying in some fields, where pollination is done. It’s been a real job to keep the water on it. Raccoons love corn. Last week I had a photo of raccoon tracks coming out of a corn field. I’ve seen many raccoons come out of corn fields. They love to eat it in the milk stage, and will actually often shuck it before eating it. This week we saw this bird in a pond next to a corn field. My son Jesse took this photo. What is it? It’s going to be on a field by field basis that control decisions should be made. A factor that enters into the mix is stink bug pressure since both problems can be treated with a spray. We have not seen a lot of stink bugs this week , however yesterday I saw 2 sets of hatchouts so we need to be on the lookout. No Southern rust has been found here but we are getting reports of it in Louisiana. Here’s some more NCLB info from Dr Bob Kemerait. UGA Extension Scientist. 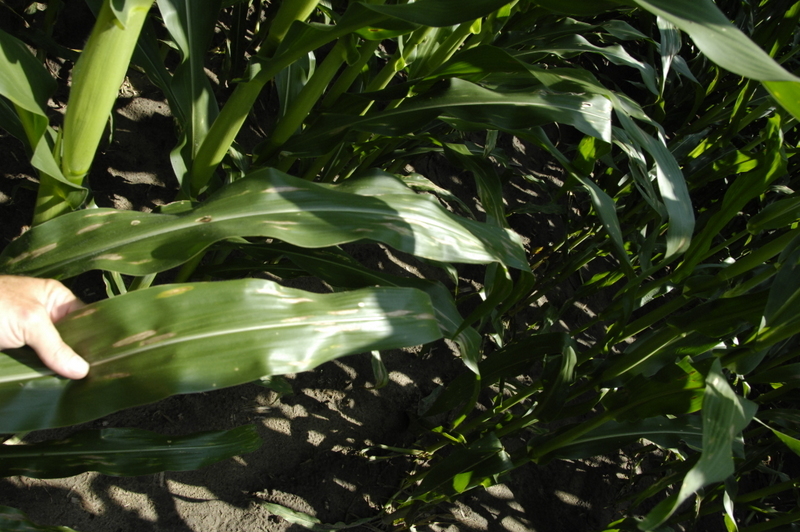 Northern Corn Leaf Blight (NCLB): It CAN be a very damaging disease, especially when conditions are favorable- rainfall, short rotation, good corn growth, early infestation, susceptible variety. HOWEVER, to complicate things, just because NCLB occurs in a field does NOT mean it will be a problem- drier conditions will cause it to stall. I believe that it is most important to protect the crop with fungicides if top-yields are expected, rainfall has been favorable, the disease appears early, and the grower UNDERSTANDS THAT FUNGICIDES ARE AN IMPORTANT TOOL, BUT NOT GURANTEED TO IMPROVE YIELD WITH NCLB EVERY TIME (early infestation with southern corn rust ALWAYS warrants a fungicide where yields are to be protected.